The Trimble® Field-IQ™ crop input control system provides you with a complete field application solution, enabling productive and efficient operation for your planting and nutrient and pest management operations. 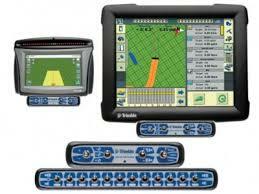 The Field-IQ system works with the Trimble FmX® integrated display, CFX-750™ display, and the TMX-2050. Use the GreenSeeker® handheld to instantly take a reading of your crop's health. Readings can be used to make non-subjective decisions regarding the amount of fertilizer to be applied to your crop, resulting in more efficient use of fertilizer—a benefit to your bottom line and the environment.